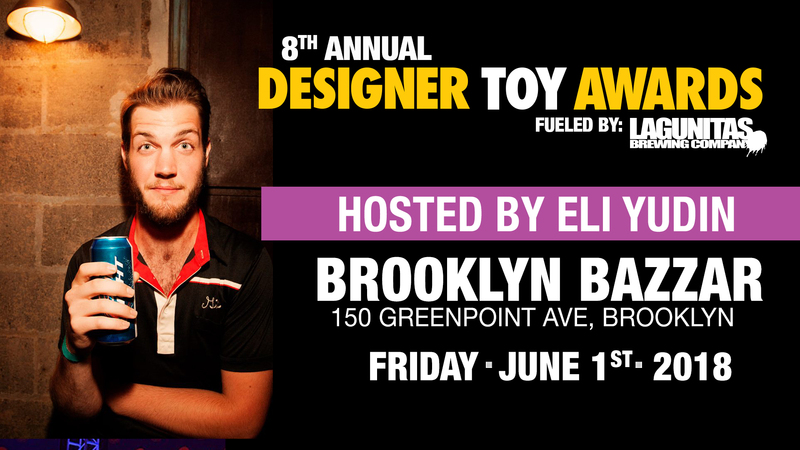 The Designer Toy awards are super excited to announce the host and venue for the 8th Annual Designer Toy Awards!! Taking place the night of Friday, June 1st at Green points Brooklyn Bazaar, the awards ceremony will be hosted by Brooklyn comedian Eli Yudin! Eli Yudin is a comedian based in Brooklyn, NY. He started comedy while at college in Ann Arbor, Michigan, during which time he won the "MI Favorite Comic" competition for best student comedian, as well as opening for Russell Brand at Eastern Michigan University. After graduating, he moved to New York City, where he's been ever since, performing all over the city & outer boroughs. He's performed in comedy festivals across the country, including the Brooklyn Comedy Festival, Bridgetown Comedy Festival in Portland, Oregon, Cape Fear Comedy Festival in North Carolina, and Crom Fest in Denver. Eli has always been surrounded by underground subculture, from his early days interning at Miska to his current days eyeballing Kozik labbits, and we couldn't be happier to have him MCing our prestigious event!